As we undertake this important process, let us pray the Holy Spirit to lead us in the right way that we may elect a devout and good man to be our chief shepherd. You can read more by downloading the paper in pdf. here. The Anglican Network in Canada church, St. George’s, is planning on a new building in Burlington. The city’s planning and building department recommended that a 0.6 hectare piece of employment land at 4691 Palladium Way be rezoned to allow the construction of a place of worship. The Post has learned it will be an Anglican church. The site is located just west of Appleby Line, bordering Hwy. 407, in Alton. Community development committee approved the recommendation. It will go before council on Sept. 4. Permission for the rezoning was granted at the September 4th meeting. Notice that the Burlington Post reported that the new building will be for an Anglican Church. This does not sit well with the Diocese of Niagara, a self-proclaimed inclusive and affirming diocese. A number of its clergy lament that the word Anglican is not a registered trademark, so, much as they would like to, they don’t have exclusive – and I do apologise for my blatant and unfeeling use of the “e” word – use of it in the Niagara region. We want to clarify the new church is being proposed by the Anglican Network in Canada, a group that broke away from the Anglican Church of Canada in 2009 to protest our actions in favour of the full inclusion of homosexual persons and the affirmation of their committed relationships. The six existing Anglican churches serving Burlington are all part of the Anglican Church of Canada. We are diverse, vibrant faith communities focused on welcoming all and making a positive difference in Burlington. We know some of our parishioners were confused by the article. The term “Anglican” is not a registered trademark and its usage is not restricted. Nonetheless, we hope future reporting of this story can make a distinction between the two groups. As my one-year master’s degree program in Pamplona, Spain closes, memories of my first days here flood back. I remember with fondness and embarrassment my first attempts to speak and understand Spanish. One of the tips I found useful was to read in Spanish something I am already familiar with in my own languages. 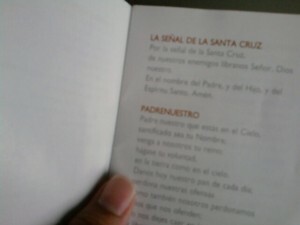 I turned to learning the Spanish versions of the Catholic prayers I’ve memorized from childhood, and to following the Spanish mass with a prayer guide. At first I was distracted from prayer, for instead of focusing my attention to God I was comparing the Our Father to the Padre Nuestro, amazed at my own improving ability to recognize words, conjugations, moods, and sentence structures. Later on, however, even this linguistic exercise turned into meditation. “Padre nuestro” means “our Father”…what does it mean for God to be “our” Father? “Que estas en el cielo”…”estas” is the conjugation for the informal second person pronoun “tu” while “esta” is the conjugation for the formal second person pronoun “usted”…what gives us confidence to we address God with the familiar “tu” instead of the formal “usted”? And so on. As I learned more Spanish prayers, their beauty blew me over. To this day, I do not believe those who say that Spanish is the best language to talk with God; any language is as good as another for prayer. Still, there seems to be a special “something” about Spanish prayers, about Spanish piety, that I could not identify. Whatever that “something” is, whether it exists or not, it could not be denied that when the Catholic prayers were recited and heard for the first time in many countries (including my own), they were in Spanish. Spanish is also the language of many great saints and mystics. Every time I recited prayers in Spanish, the thought that I was communicating with God with the same words that people like St. Theresa of Avila used thrilled me. Clearly, learning to pray in another language not only helped me improve the fluency in the language; it also helped improve my prayer life. The way in which learning to pray in another language helped me most is that it taught me how to pray like a child again – like a child learning his prayers for the first time, struggling not to stumble over the words. In my first days of learning the language, I’ve had to use a guidebook to be able to pray in a group. To this day, even if I’ve already memorized the common prayers, I still worry that I might forget a word or a phrase or say it wrongly. So I ask God to teach me the words with which I am to speak to Him – in short, as the apostles asked Our Lord, I ask Him to teach me how to pray. I feel confident that even if I make a mistake, God will understand and smile at me.